√ Ideal after injectables & fillers (e.g., Radiesse®, Restylane®, Juvederm®). 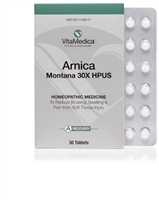 Homeopathic Arnica montana has been used for centuries to treat bruising, swelling and pain associated with soft tissue injury. 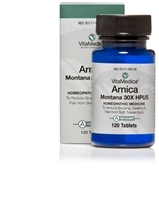 Ideal after less-invasive surgical procedures and for sprains and strains from overuse or sports injury. With a two-week supply per bottle, the next time you suffer from bruising & swelling, relief is just a medicine cabinet away. Bottle contains 120 tablets. Formulated with natural ingredients including Arnica montana, vitamin K, vitamin C and botanicals to improve the appearance of post-procedural bruising. 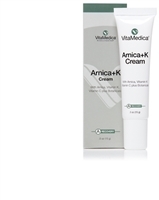 Arnica+K Cream softens, calms, moisturizes and restores bruised skin. Tube contains 0.5 oz.